Arturo Vidal is aiming to win "everything we play for" at Barcelona after completing his move on a three-year contract from Bayern Munich. The Chile international confirmed at the weekend that he was leaving the German champions for the Camp Nou, but he has now put pen-to-paper on the deal for an undisclosed fee on Monday. 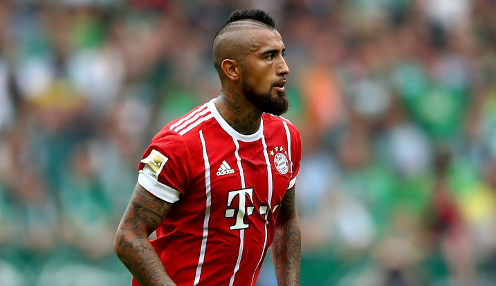 Vidal, who scored 22 goals in 124 appearances for Bayern and won the Bundesliga title three times, the German Cup and two domestic Supercups, will fill the gap left by Paulinho's loan departure to Chinese side Guangzhou Evergrande. I am here to win all the trophies available and I will give everything on the pitch to achieve this. The 31-year-old has also won four Serie A titles, the Italian Cup and two domestic Supercups during a spell with Juventus, but he has not lost his hunger to secure some more silverware with Barca. In a statement on the club's website, he said: "Happy. To be honest, I am very happy. I am looking forward to starting training with my team-mates, to wearing such a famous shirt, and to doing important things here. "It is a dream. I hope to achieve my objectives. I am here to win all the trophies available and I will give everything on the pitch to achieve this. "Winning everything. During the three-year contract, I hope we can win everything we play for. "I am excited to play with [Lionel] Messi, [Luis] Suarez, Sergio Busquets… they are all great players." Barca are 1/5000 to win La Liga this coming season, while Vidal is 6/4 to win his first Champions League title with the Catalan giants.